During the four weeks that Travis Card was holding up convenience stores and eateries with a pellet gun last spring, he was addicted to opioids and on waiting lists to get into a treatment program, according to court documents filed by his lawyer. 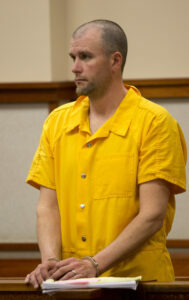 Travis Card, 38, pictured at his arraignment in Portland in April 2018, ultimately pleaded guilty to robbing or attempting to rob 11 small businesses in southern Maine. He will be sentenced Feb. 27. Card, 38, ultimately pleaded guilty in federal court to robbing or attempting to rob 11 small businesses from Old Orchard Beach to Cumberland. He will be sentenced later this month, and he could face up to 20 years in prison. The rash of crimes in southern Maine put store owners and employees on edge, and police warned people to cooperate with the demands of a seemingly desperate man. A motivation for the robberies had not been identified until a memo filed in court this week stated that opioid addiction had led Card to commit the crimes. Defense attorney Heather Gonzales wrote that Card has struggled with addiction ever since a doctor prescribed him painkillers after knee surgery in 2012. While she emphasized the seriousness of the robberies, she also drew a clear line between his drug dependency and his criminal history. Easy access to painkillers has been cited as a contributing factor to the opioid crisis, which prompted the Maine Legislature to pass a strict new prescribing law that went into effect in July 2016. Still, law enforcement officials have said much of the state’s crime is tied to drugs. “If ever there was a face of the devastation and destruction that medically prescribed opiates can have on an otherwise model citizen’s life, it is that of Travis Card,” Gonzales wrote. Gonzales recommended a sentence of five years in prison and three years of probation. She also asked the court to order drug treatment for Card during and after his incarceration. The government has not included a sentencing recommendation in any documents filed in court. A spokesman for the U.S. Attorney’s Office declined Wednesday to comment on the case. Travis Card faces as much as 20 years in prison for robberies including the one caught on video on March 20, 2018, at Riverton Gas in Portland. 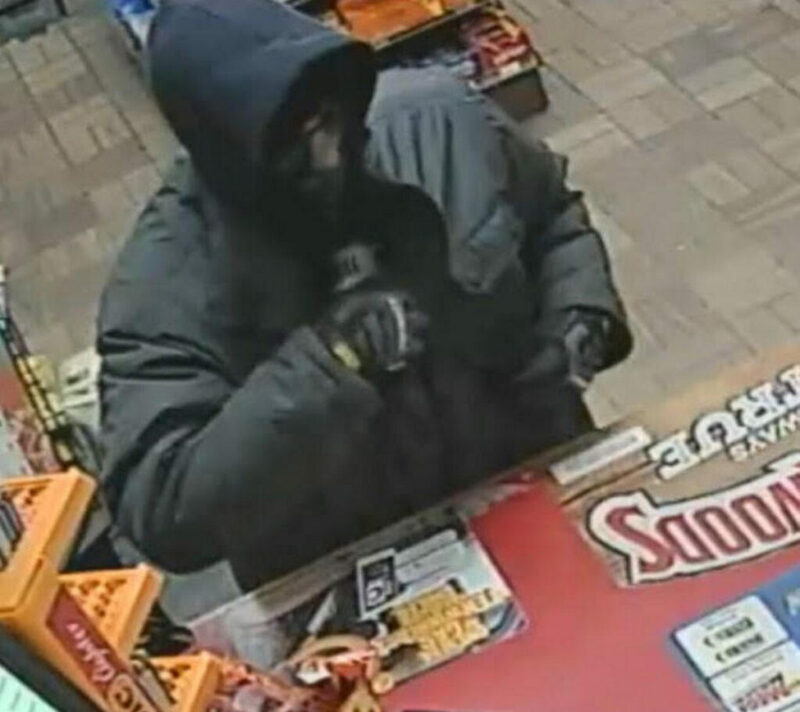 Local police and FBI agents investigated a possible connection between 15 armed robberies in March and April. Most reports involved a masked man in dark clothing and armed with what was believed to be a handgun. He entered businesses that were almost empty and demanded cash. Law enforcement officials encouraged targets to hand over the money without a fight. But some owners were frustrated and defiant, and one put a loaded gun behind his convenience store counter when a robber hit a nearby shop. Card was arrested April 13 in Westbrook. His weapon turned out to be a pellet gun. His total gain from the crimes was less than $3,000. He was initially charged in only one robbery, but he admitted to 10 others. He pleaded guilty Aug. 2 in U.S. District Court in Portland and has been in custody at the Cumberland County Jail ever since. The memo included new details about Card’s life before his arrest. He graduated in the top half of his high school class and went on to study chemistry at the University of Maine. He left school to support his family when a car accident left his dad unable to work. He married his college sweetheart in 2007, and they started a family. Card worked at Napa Auto Parts for more than a decade and owned a home in Windham. In letters to the court, his parents described the way he would stop at their house on the way to work to check on them and say hello. In 2012, when he was 32 years old, Card had two knee surgeries. He took his pain medication as prescribed, but his family members said his personality became cold and edgy when it ran out. That fall, Card started stealing car parts from his job and pawning them to buy pills. He was soon caught, charged with felony theft and fired from his job. He confessed his addiction to his wife, but his lawyer said they were turned away from a residential drug treatment program because his drug use was not significant enough. The following spring, Card relapsed and was soon charged in a string of burglaries and thefts. He pleaded guilty to two theft charges, one burglary and one charge of violating conditions of release. He served one year in jail and was sentenced to three years of probation. Out of jail, Card continued to fluctuate between sobriety and relapse. He injured his shoulder in December 2014 and was again prescribed opiates for pain. When his prescription ran out, he broke into cars in a parking lot during a break at his job, looking for items to pawn for cash. He was arrested and incarcerated for another year. He completed probation and was sober until a friend offered him heroin in January 2018. His wife told him he could not live at home until he sought treatment, and he talked to his doctor in February 2018 about Suboxone, a medication that relieves opioid cravings and withdrawal sickness. None of the programs that accepted his health insurance had openings, so he put his name on their waiting lists. He was still waiting when he committed the first robbery on March 20, 2018. His lawyer said Card regrets the emotional trauma he caused to the victims in this case and wrote them individual letters of apology, although she did not know if the prosecutor’s office delivered all of them. Card will be sentenced Feb. 27.